The Cake Poker network has been in the headlines for all the wrong reasons recently, but amidst these circumstances the poker network is still proving to be a major player on the online poker scene. 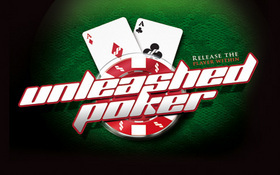 Cake Poker has just announced the addition of a new online poker room to their network: Unleashed Poker. The problems for the Cake Poker Network began when Sportsbook and PlayersOnly migrated to the Merge Gaming network earlier this year, followed by a recent security breach involving inadequate encryption, both of which have caused a major drop in player traffic –Cake Poker Network once contending for a top 10 spot has now dropped back to #16 according to pokerscout.com. Unleashed Poker will join the network that includes Cake Poker, Doyles Room, UnaBomber Poker, Molten Poker, Intertops Poker, and RedBack Poker among dozens of other smaller online poker sites. Only time will tell if Unleashed Poker can become a major player in the online poker world –Something Victory Poker has been able to do recently– or if they will sink into relatively obscurity. This entry was posted on Tuesday, August 17th, 2010 at 12:09 pm and is filed under Poker Industry News. You can follow any responses to this entry through the RSS 2.0 feed. You can leave a response, or trackback from your own site.